Volkswagen plans to decide in the first half of this year whether new battery technology under development at U.S. startup QuantumScape Corp. is ready for use in its electric cars. 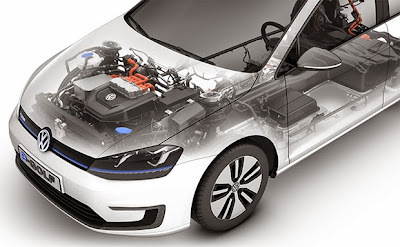 The technology’s potential to boost the range of battery-powered vehicles is compelling and tests are progressing, VW Chief Executive Officer Martin Winterkorn said outside a press conference in Stuttgart, Germany, on Tuesday. “I was there last year,” Winterkorn said. “Progress has been made,” and the company will be able to determine how to proceed by July. VW acquired a 5 percent holding in QuantumScape and has options to raise the stake, people familiar with the matter said in December. The German carmaker is considering using the energy-storage technology, which is fireproof, for vehicles from the namesake brand as well as at the luxury Porsche and Audi divisions. Winterkorn said in November that he sees “great potential” in the new power-storage technology, which may expand an electric vehicle’s driving distance between recharges to as much as 700 kilometers (430 miles). That’s more than three times the range of the battery-powered version of the VW Golf. Tesla’s Model S has a range of 270 miles, according to its website. Closely held QuantumScape, founded in 2010 by former Stanford University researchers, is working on solid-state batteries as an alternative to liquid electrolytes such as the lithium-ion technology used in many electric cars today. Solid electrolytes are burn resistant and could potentially store more energy and provide more power to extend the range of electric vehicles. One day all this will be history and we can put the petroleum industry to rest. Sooner than later I trust.